SURREY, B.C. —No. 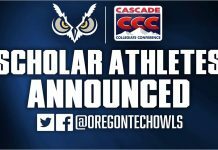 12 Oregon Tech Hustlin’ Owls (18-3, 32-11) swept a rare tripleheader from the UBC Thunderbirds (8-13, 12-19) Friday afternoon at Softball City. The Owls had a relatively easy time with 11-5 and 14-3 wins, respectively, to start the uncommon triple bill, but the T-Birds put up a tremendous fight in the series finale. The game was tied 5-5 heading to the seventh where the Owls ended up plating the game winning run to complete their fourth straight conference series sweep. The Owls took an early 4-0 lead in the top of the first on just two-hits, however UBC answered with four-runs of their own in the bottom of the frame on a grand-slam homer by Cassa Courtney. An Ali Graham RBI single gave OIT the lead at 5-4 in the 2nd. UBC once again tied the game in the bottom of the inning. Tech then grabbed the lead for good with 2-runs in the 4th and 4-runs in the 5th to earn the 11-5 win. Graham struggled early in the circle but settled down to pick up the win and improve to 12-5 on the year. Graham helped out her own cause at the plate in leading the OIT offense with three-hits in the win. Kiahna Brown, Dre Sotelo, and Cierra Barkis added two-hits apiece for the Hooter. Graham picked up where she left off in game two, scoring Brown on an RBI double in the top of the first to give Tech the 1-0 lead. Baylee Wyscaver got in on the fun with an RBI single to score Graham and give OIT a 2-0 lead. The Owls added to the lead with 4-runs in the second inning on 2-hits and 2-errors by the T-Birds to go up 6-0. 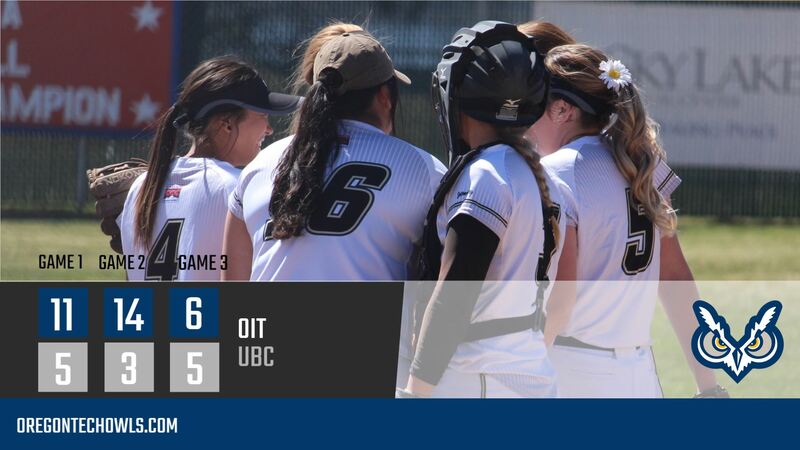 UBC scratched across a run in the fourth, only to see OIT make it a 7-1 game with a run in the 6th. OIT then put the game away with 7-runs in the seventh on 9-hits. 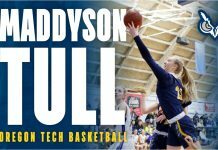 UBC rallied but could only draw any closer as Oregon Tech won 14-3. Tech’s Sarah Abramson improved to 14-4 on the year picking up the win in a complete game effort giving up just 6-hits and 2-earned runs with 4-strikeouts. Brown and Wyscaver led OIT with 3-hits each with Graham, Sotelo, Barkis, and Jacey Conklin adding 2-hits apiece in the win. For the third straight game, the Owls opened the scoring, this time in the top of the second where some small ball helped get runners into position allowing Shayna Ige to score on a McKenna Armantrout RBI single. That was the start of what turned into a four run inning for the Hooter that featured RBI hits by Logan Nunes and Brown. UBC was once again quick to answer with 2-runs in the 2nd and took their only lead of the day in the 3rd with 3-runs to go up 5-4. That lead was short lived as OIT tied the game in the next inning on another Brown RBI single that scored McKenna Armantrout. With neither team able to break the tie through the next two innings, the game remained deadlocked heading into the seventh. 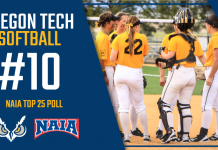 In the top half, Oregon Tech had runners on second and third with one down when Catcher Jacey Conklinbrought in the go-ahead run with an infield single to give the Owls the sweep. Brown and Armantrout led OIT with 3-hits each in game 3. Tech’s Sarah Abramson improved to 15-4 on the year pitching the final three shutout innings.